A venue that is relatively unknown, the See had many great concerts. Not many posters were produced for this location and the best were done by Gary Grimshaw. 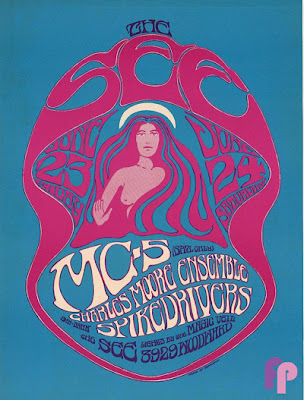 This particular poster is considered the finest of his works for the See, along with the poster listed as MSO.SEE.1967.06.30 in the “Miscellaneous Other Items” portion of our Web site. Both posters have related handbills that were printed in different colors than the poster itself. The original poster was printed on thin white stock and measures approximately 15" x 20". The original handbill was printed on thin white stock and measures approximately 8" x 11".